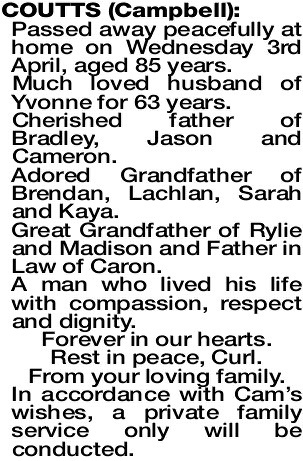 Dearly loved husband of Yvonne for 63 years. So strong, so courageous with an amazing attitude to life. A medical marvel. Very proud of his 3 sons Brad, Jason and Cam Jnr, and adored his grandies. My solitary man, one of a kind. 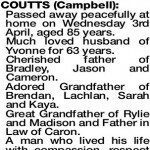 COUTTS CAMPBELL Passed away peacefully at home on Wednesday 3rd April, aged 85 years. Much loved husband of Yvonne for 63 years. Cherished father of Bradley, Jason and Cameron. Adored Grandfather of Brendan, Lachlan, Sarah and Kaya. Great Grandfather of Rylie and Madison and Father in Law of Caron. A man who lived his life with compassion, respect and dignity. Forever in our hearts. Rest in peace, Curl. From your loving family. In accordance with Cam's wishes, a private family service only will be conducted. 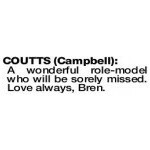 COUTTS CAMPBELL A wonderful role-model who will be sorely missed. Love always, Bren. 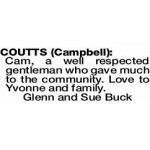 Cam, a well respected gentleman who gave much to the community. Love to Yvonne and family.